Or basically me thinking "Oh, I need a good picture, where are the darn cookie cutters?" On the plus side, Faith has always been fascinated with Egypt, hence her love of camels, and Ben will be at a 3 week Ancient Egypt day camp at Colorado College this summer, so it's not a bad theme. 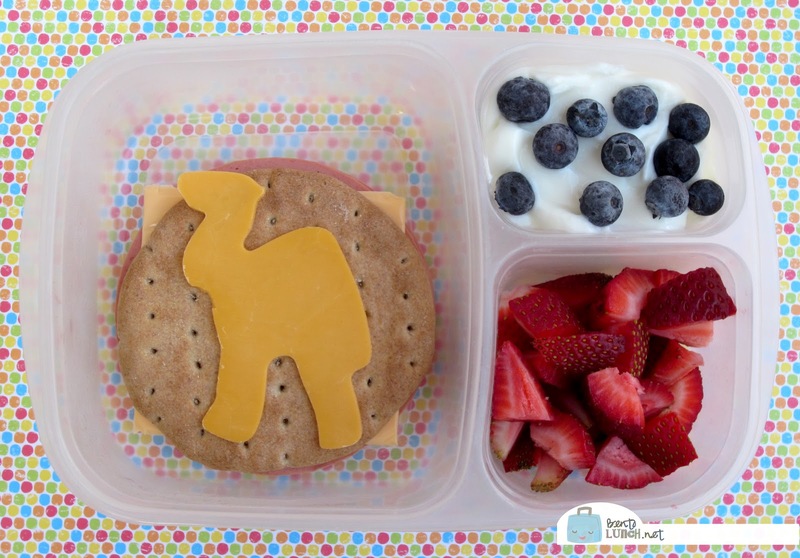 Both kids have the same lunch--ham and cheese sandwich on whole wheat rounds, topped with a cheddar camel, vanilla yogurt with frozen blueberries (which thaw by lunch), and sliced strawberries. I also sent animal crackers for a snack. We're packed in our Easy Lunchboxes today because I wanted to stack a few lunches in the fridge so I had them ready, it's a busy week! My daughter loved Ancient Egypt, too! Your simple lunch is super cute!